The place to go for paint pledges or hobby discussion. 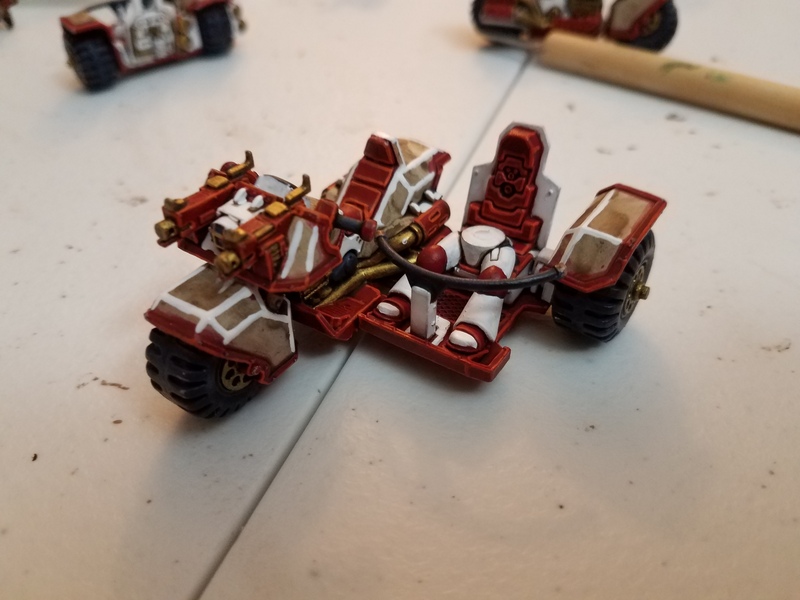 I've decided to start this little blog to show what it is I am working on and discuss my point of view on painting, modeling and other non-tabletop strategy related aspects of the hobby. My brother taught me a lot about miniature painting and modelling. He always said I was lucky to have an older brother like him to show me some cool tricks and to get advice from (Actually most of these pictures I've sent to him to show my finished models). While I am not the best painter in the world I'll pay it forward the best I can and try to just explain what it is I do in as much detail as people want in hopes it helps somebody. So if you have a question on how I get a certain effect let me know and if I'm working on something that includes that effect I'll even give you a step by step look and a description of what I'm looking for on my models. I'll probably point out some things I do as I go along too that took some figuring. Ultimately whether your quality is good bad or indifferent my #1 advice is to paint. If people's advice holds you back from painting because you are concerned about it ignore it. 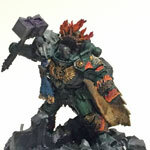 Paint, drill and convert the big cool models and do the best you can. In a couple years you can always touch it up. Ideally no matter who you are after a couple years experience you should look at your old models and go man I would never let that leave my table today. You won't get that way though if you don't paint. 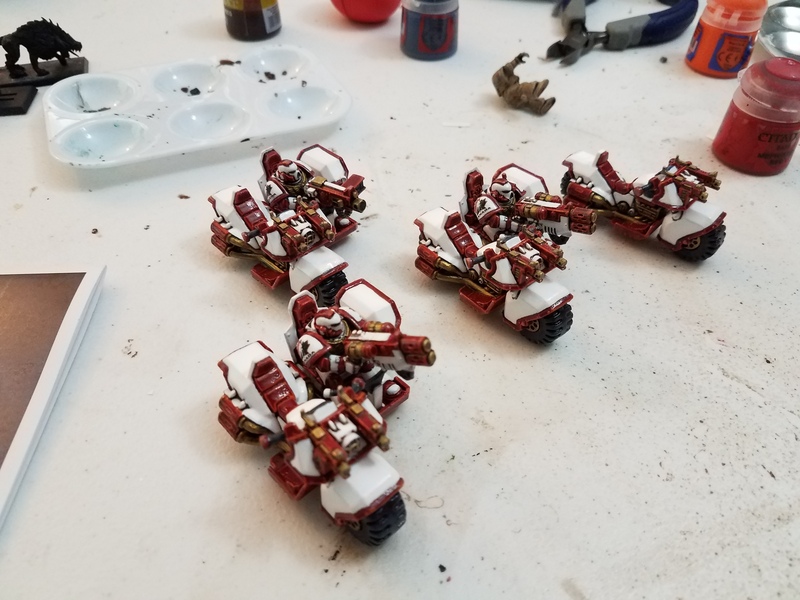 I'm looking to finish these bikes so that I can then start working on the riders. Everywhere you se brown will be white by the end of this step then I just have to do touch ups and varnish the model. I've finally gotten the riders all magnetized so that I can equip them how I want in the future. The goal is to finish the 17? riders and these bikes before the fate of Konor campaign starts. I am dragging my heels though cause getting the white on nice and consistently is meticulous. 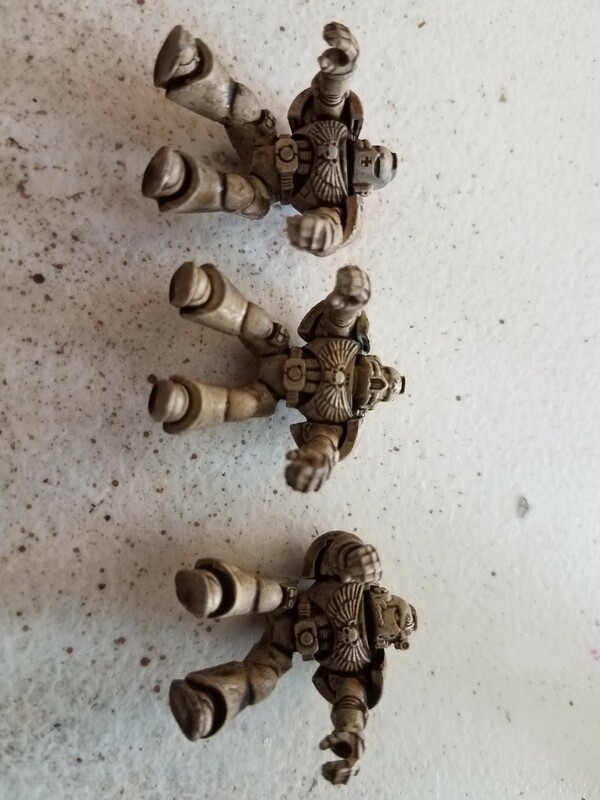 My next project will either be more bikers or some Primaris marines. Back to painting! The game is so much more immersive and fun if there is some color on the models, and with time and effort anyone can have a great tabletop quality army. Basecoat, shade wash, highlight works super well for quick and dirty painting. 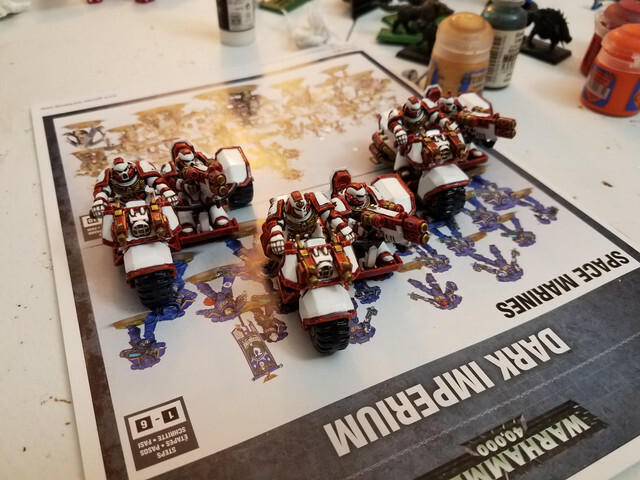 And now the attack bikes are table top ready. Next step is to finish the main biker for the attack bikes and the rest of the riders for the other bikes. 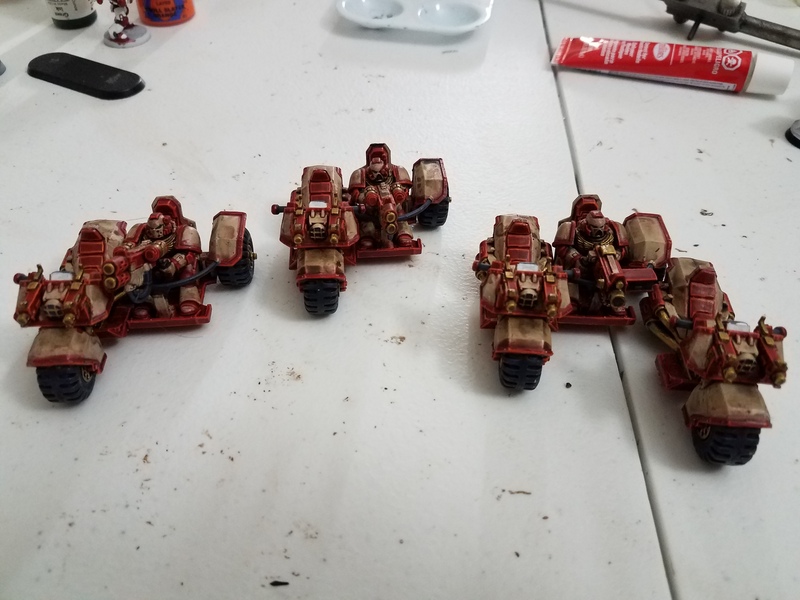 On the plus side painting dudes is way quicker and easier than bikes so hopefully that will go really quickly and I can totally finish the bikes. So my method for painting white is very slow when it's with a large flat area like bikes. As I want to use this to sort of highlight some painitng techniques and since I don't expect to paint more bikes for a bit while I work through some other projects I figured this would be a great opportunity to sort of highlight my method. So This method all started to come about when I was using the inks (Early washes made by GW basically) and could find any color except for white. I was kind of curious as to what would happen with a white ink or white wash so that the recessed areas got highlighited rather than darkened. Never really found anything to give that effect but I did eventually come across this. It doesn't act like the washes like I was hoping however it is very watery with a lot of pigment in it and the white is very nice. So in order not to have brush strokes I basically just apply a generous amount and then let it dry. The drying is why it takes so long. It's also why I don't have any brush strokes. I usually have to do 2 coats and on smaller pieces (like maine arms/torsos) it dries pretty evenly. Otherwise it acts more watery so it will pool up and spill over. So legs you'll get it very white at the bottom and thinner at the top. This requires multiple coats so athat you then just focus on the top half and a third light even coat to even things out. With harsher edges on larger flat areas though it gets more tricky. I'm still experimenting with this but the method so far is to line the edges then do at least two coats in the middle and repeat on the edges as necessary. Again the ink i's super watery so it's trying to run down. You have to keep the parts that are drying totally level and leave them to dry which is why this method takes a while. Further the ink will start to dry on your pallet and create chunks so you want to refresh that. Good brush control is critical to reducing errors because if you are too far over to a wall the ink may just pull itself right into the gap. I also recommend not painting anythign else while working on the white. Any colour crossover will give you more of an off white then a platinum white. I even have a brush and pallet I use just for white and I always clean out my water cup thoroughly before starting in on white. I use red a lot too and I don't want my team Canada dudes to be pink. Further the red pigment can rub off on your fingers and the white will show it easily too so I recommend painting the white last. Lastly I recommend sealing it in a varnish. Pictures below. 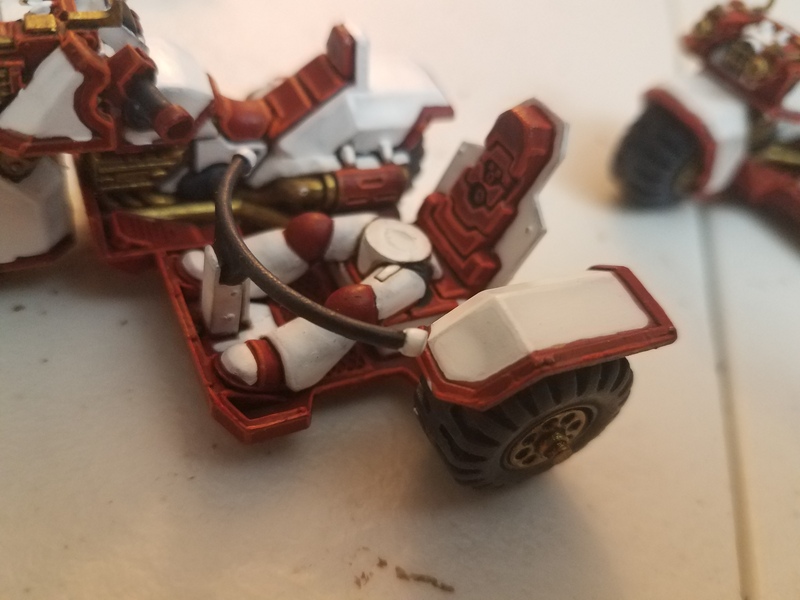 Side cart uneven white on the wheel cover because the ink pooled to the bottom because it was not laying flat during drying. First coat on the back wheel cover. Even though it was laid flat and it is consistent you'll notice the white is really pure on where I put the lines first. Had I not done the initial lining the ink would have moved away from that edge and the brown would have been poking through. Ideally how the white turns out. Nice and smooth and clear. Bottom wheel white blow out. I used a thin brush and black to cover this up for the final product. Next on my list are the remaining guys for the attack bikes. Next on the docket after them are all the bikers for the regular bikes but I really just want something nice and easy at the moment. 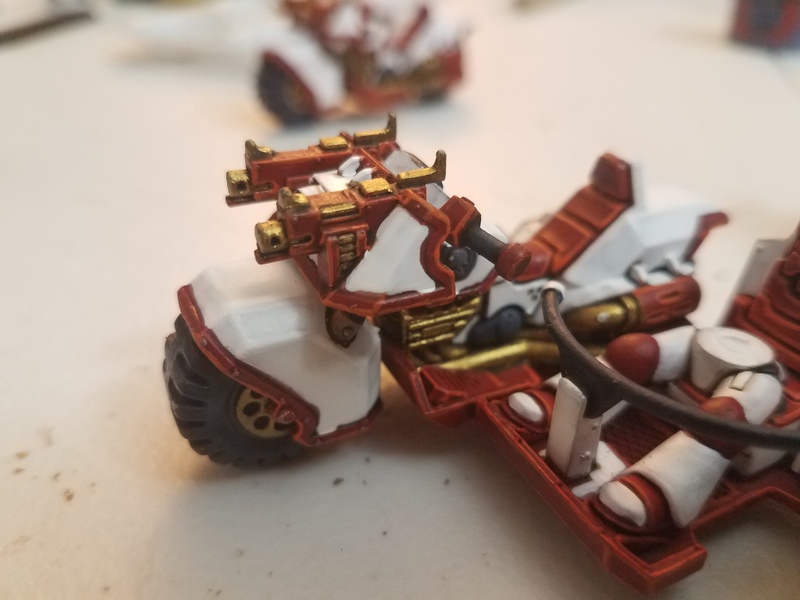 Plus then the attack bikes will be totally finished! Fascinating. I never even considered that white ink might be a thing! I found a recipe on the web at some point for making your own washes. The base is basically 10 parts distilled water, 9 parts matte medium, and 1 part flow-aid. To a small bottle (like a Vallejo dropper bottle sized amount) you add your ink until you have the saturation of color you want. I wonder how this would work with white ink. 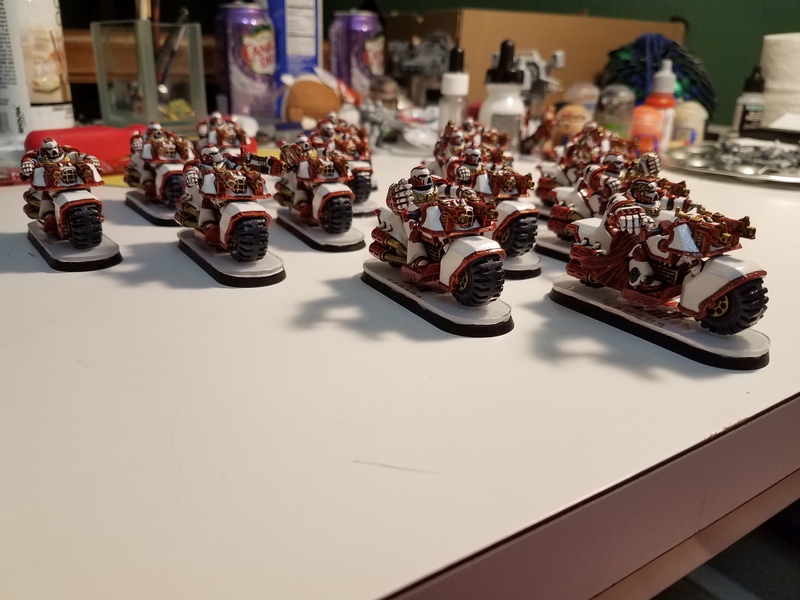 So I finished the bikers pretty quickly. The attack bike now are totally complete. I'm pretty happy with them but the varnish makes it so that they don't sit real nice on the bikes. So as part of my intent to discuss how I go about painting I took some in process pictures so I could explain why I went in certain directions and chose certain colours. So I was told to use light blues and grays. In some ways I really like this guy right here. This to me is just a classic space wolf look. As far as trying to balance colors on here you'll notice he's mainly a light gray with some plates of bluer gray. The blue gray helps to break up the model to help your eyes differentiate the different aspects of his anatomy. Initially he was just dry-brushed but I found I needed to highlight the edges for definition. The cloak mostly came out really nice too. It was a much brighter blue and so stood out very nicely. Also that lining on the edge really defines where the edge of the cloak is and gives very nice definition. The reason I did not stay with this as the final is how much the silver sort of melded into the gray. Further the sword didn't draw the eye nor did anything except the cloak. I didn't want the cloak to be the main focal point. Also this is a tabletop game and I wanted the model to read much better from afar. Therefore I needed to break up the monotony of grays and blues. 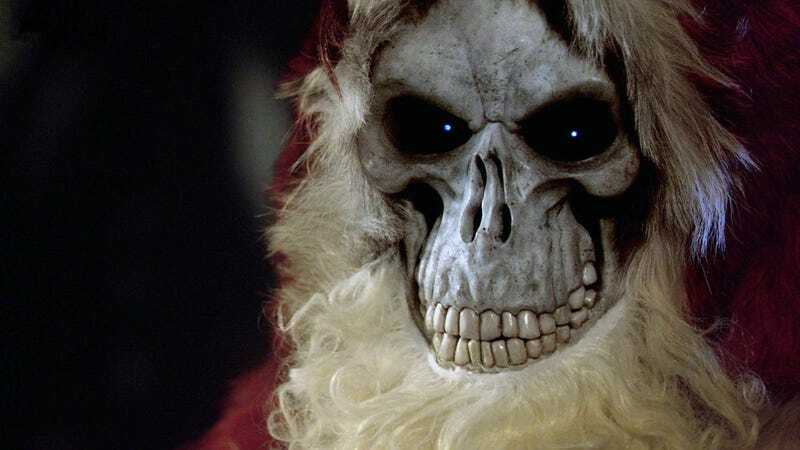 Were this my army I would have introduced a new colour and maybe sprinkled it in. A yellow or orange would have been quite good at that. However I wasn't making this for myself so I turned to adjusting the brightness. As I said the cloak was something that really drew the eye. So I used the bright blue to help draw the eyes to places I wanted it to be. That would be the center chest piece which ideally is one of the first parts you noticed on the finished model. 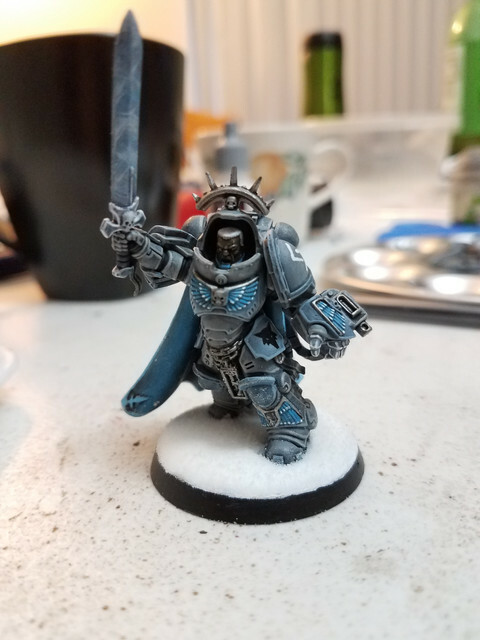 The weapons are other elements you want to draw attention to so I took white did a blue wash on it then highlighted it white on the power fist fingers and the sword hilt. The sword itself now looks well defined and doesn't blend in as it is a mix of almost all the other colors in the model. I added white runes on the model to give something interesting to look at when the model is looked at from any direction. I had decided to do a darker skin tone on this model and my assumption was the light grays would really allow it to pop. 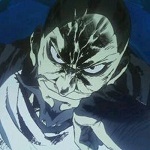 However that hood makes a freaking deep shadow which threatened to make the face be lost entirely. Therefore I went for white hair and made him an old man (honestly it's one of the most endearing features of this model to me. It looks so much like he is yelling at kids to get off his lawn it's great). Doing a lighter skin tone would have been a better choice in terms of readability from afar and being able to make out details. However I don't typically paint dark skin so it was something I wanted to try out. When I get some brown paints again I may go back and retouch him up. I'm concerned about highlighting the face too much and then I lose the look I was going for. This is a model I really enjoy the final result up close but I would continue to work on if he were mine. Take a step back from him and the grays and blues meld. All that detail gets lost. Were I to be basing an army around this scheme I would have tried to find a way to make him more distinguishable since it is a tabletop game and we look at the model while standing and not up close. The last point I will touch on is the base which I think is very important. 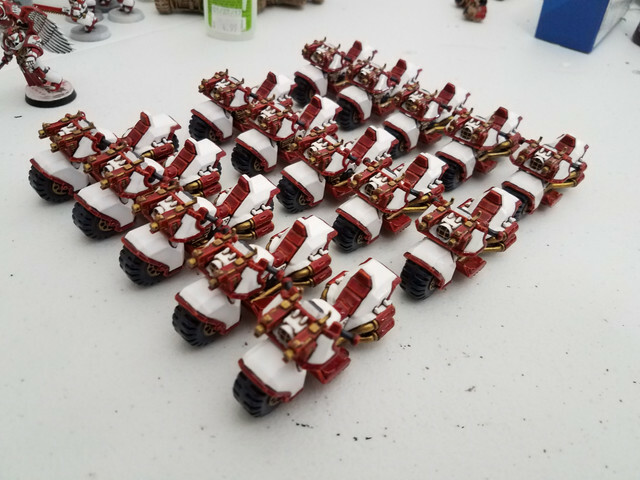 She likes the whole winter wolf type of deal so snow made a lot of sense and I already have my tau in snow so I had all the materials lying around. The black edges really help to highlight how bright and soft the model is by giving it some contrast especially when put right next to the white of the snow. You should always put thought into your bases and how they complement your paint job. So I've been asked a couple times how I get my guys so shiny and I feel my answers have always been disappointing. So here is the spray I use. I like the spray varnish because it's quick and does a pretty nice job with no brush strokes. The downside is that it can get thick on area and it will dry onto what it is resting on so you have to be a little strategic and patient to make sure you don't ruin your model right at the end. You could do this with a brush and ardcoat but I think you may get brush stroakes. Basically take this stuff spray your guys so they look nice and shiny trying to minimize the amount of spray. If the model is based when you spray it laying down to get in the crevices make sure you stand it back up. For models without a base put the flat side down that is the part that will be seen the most fires (SApace marine shoulder pads icon side down first. That way it will get the second coat and will be as clean as possible. Let the models sit for like 15-30 min. Remember any defects now are on a finished model take the extra time not to ruin it with a thumbprint. I'll watch an episode or two on the TV as a timer and distractor. Apply as many coats (remember less is more but you need a minimum it is kind of a tricky balance. I'd practice on some models you care less about first for me it was kroot lol) as you find necessary to get the crevices so you have an even coat. Then let the sucker dry for a day. I play a lot of D&D so for me if I finishe my models on Thursday evening its D&D Friday and saturday and the coat is nice and hard on Sunday. The D&D distracts me cause usually I like to oggle the finished product before I move on to the next one. Also for best results wait for a nice sunny day without much humidity. Besides how to varnish the question is why varnish? I want a nice clean look for my two recent armies and something being bright and shiny fits that bill. You can get a semi-gloss or matte varnish that will give you different looks with the semi-gloss a dull luster and the matte finish a very soft finish and is probably what most people will want to use especially as it changes the look of your models the least. I used matte varnish on my chaos warriors long ago for instance because they are more gory then highly polished and lustrous. 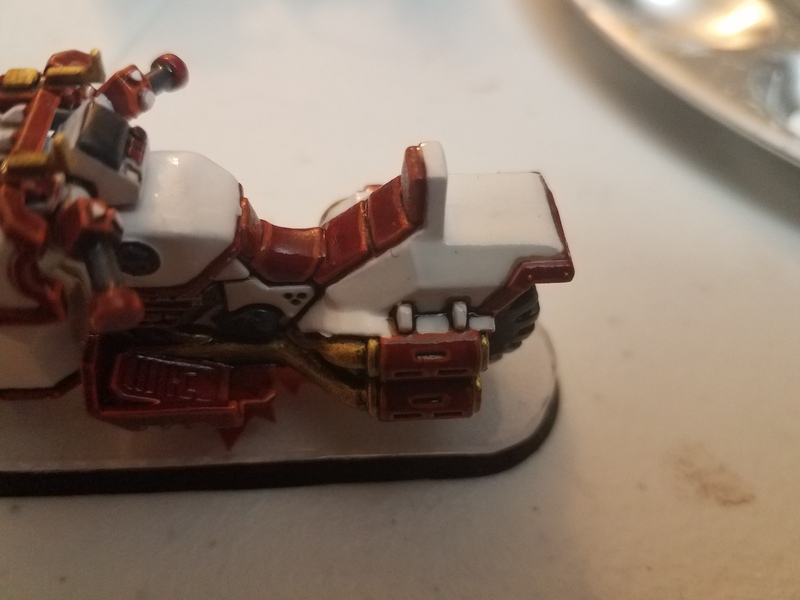 Besides looks varnish seals your models. This will help protect your paint jobs from wear. Why I like this particular varnish: I got it initially because it was cheap at wal-mart a long time ago. It is non yellowing which is important as I want my team canada marines to be a crisp clean white not off white. Maybe Nurlge would be okay with yellowing but again it's right at the end of painting and you don't want to mess the model up here. Speaking of which you can put too much varnish on models. I've found this varnish does a good job and doesn't get cloudy if some models get a bit too much on a certain spot. I actually got this on amazon last time because wal-mart didn't carry it. I swear by the stuff but I'm sure there are other cheap alternatives out there. Try it yourself that's how I got this one. I find with any spray can but specifically the varnish it is best to keep them in the house in an AC controlled room. Mine are in my office closet. I left them before in the basement and the garage and sometimes I would go to use it and the spray would be chunky. My thought is it is the thermo-cycling from hot summer days and cold winter nights that causes the can to degrade. It's not so bad if you prime a model poorly but when the varnish ruins it you will curse the day you took my advice so buyer beware! On a further cautionary note you would not want to use varnish if you want to show off your painting skills for a competition. Further if you think you may want to touch up your models later it becomes more difficult later if it is varnished. Remember the varnish is like a thin plastic candy coat it adds to your model so it fills in that fine detail. If you spray too much you can't repaint it easy. Also if you want doors that open or close special care must be taken because doors and riders are molded to fit rather nicely during assembly without paint. By varnishing you add a layer of varnish to both mating surfaces. My attack bikers sit just a bit high because of this. My painting time has been limited due to moving unless it's been painting the house. I have finished loads of my bikes though. 2 full squads (minus 1 arm and one body) and a bike chaplain. I'm really happy with the way that they came out. I am close to having my standard list fully finished. I am really enjoying painting the intercessors. They're big which makes them pretty easy to paint and I like the helmets and how plain the models are because I am not so fussy on the busy models for this army. They've actually been really good for me on the tabletop too which is why I started painting them up because I think I will be running at least 15 of them as part of my core army. So the next goal is to get those 15 done. So as I usually like to talk about some other hobby related items I have gotten asked about my big dice I like to use. The dice listed below are the dice that I purchased and prefer to use. I also use game science dice for D&D because of the manufacturing process. I am an manufacturing engineer therefore I am always looking at looking for patterns. I noticed that my chessex dice that were themed for my Tau would roll worse then the chessex dice I got for my space marines. For many instances variance within the dice won't matter say if you have a lower chance on a 4 but a higher chance of a 3 for say a space marine save. It has a larger impact on the battlefield if you are making 4+ saves though. If I notice a pattern then that begs the question of do I bring the tau dice which give me (or at least I perceive) a handicap or do I bring my space marine themed dice and get a perceived advantage? My solution was to get these dice which are as fair as I think can reasonably be achieved. So what is a fair dice? A fair dice when rolled a large number of times will give you equal access to all sides. So your chance of rolling a any numbet is equal to your chance of rolling any other number. In reality this will never really happen. Even with a fair coin no one expects it to go perfectly even between heads and tails you just want it to be really close with some numbers being higher on one die and different numbers being higher on another so that you can't choose a lucky die or anything like that. In order to get the closest to the ideal condition I looked at a video for game science dice and they sold me on Casino dice which are the fairest. Casino dice have to be as they are used in a regulated environment where lots of people's money depend on the outcome of the dice. The Pips (the little dots) are the same density as the rest of the plastic so that gravity does not want to pull it onto a specific side (1 is heavier than 6 with drill marks so it wants to rest on the bottom). Second the casino dice are machined with tolerances for flatness and edge length so the dice roll consistently between production batches. Standard chessex dice do not roll as fairly as casino dice because their dice are injection molded not machined which is a cheaper process for mass production but less consistent (but still good). Then they are put into a rock tumbler with some ink and the dice roll around with some shot (hard bits to knock down the edges and leave ink in the recesses). Think rock tumblers but with dice. Just like those rocks the dice do not comes out identical (although close because injection molding does a pretty good job). Take two of your chessex dice and lay them flat on top of each other. You'll find there are gaps on either side and it can rock back and forth. This will make an individual die want to lie more on one number than another which is why they aren't fair enough to be used in a casino. They are cheaper to make though and look cool. All that said the difference in results from the dice is in the grand scheme of things chessex dice roll fair enough really I'm just nit picky and find I really enjoy the game a lot more not having to worry about which dice I am picking up. I have the fairest dice I can reasonably get and I don't notice any patterns so I don't have any conundrums about which dice to use. The game science dice are fairer than chessex dice because they are injection molded but not rock tumbled. You have to paint on the numbers. This gets it about as fair as you can for D&D as there are unfortunately no machined D20's but you can get smaller dice that are cheaper than casino dice and fairer than chessex. Well I didn't post them prior to the tournament as I didn't want to tip my hand at what the whise scars would. The bike bodies are old but the crozius arcanum, the teeth of terra backpack, the power axes and the bike storm shields are all new. Next on the docket is to finish off the ten intercessors. I have been getting a bit distracted though by the new Tau I have just fallen into. 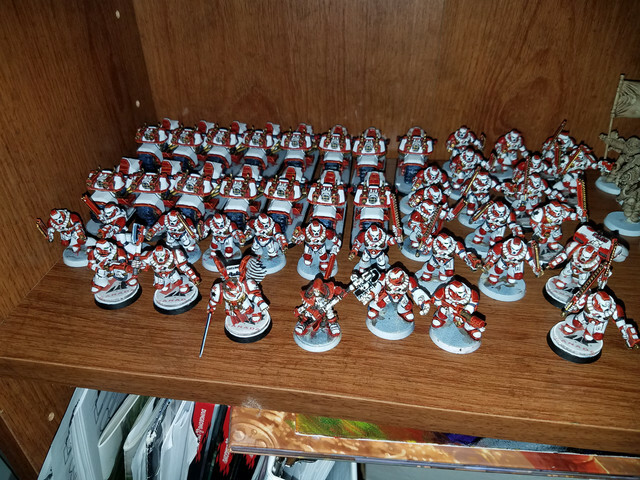 My brother has given me a bunch of his Tau he is no longer interested in. 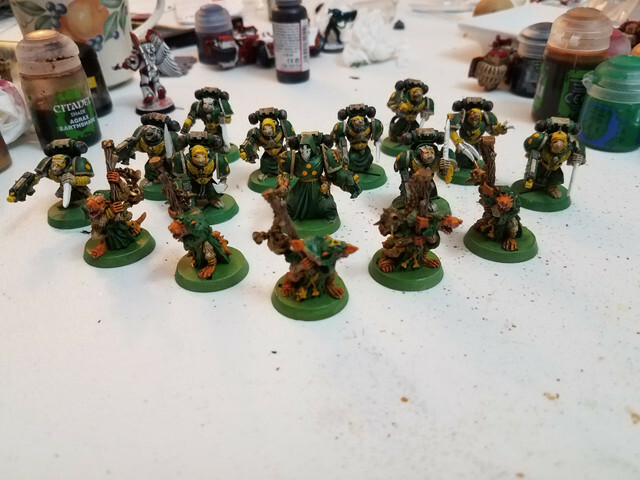 Still no big suits but I have come into 12 more fire warrior 18 pathfinders, around 2 dozen drones, 2 devilfish, a piranha a really old cool ethereal with staff, a kroot shaper and 5 of the old metal stealth suits plus some crisis suit weapon bits. After playing the Tau in the tournament I think I will be running them a bit more. 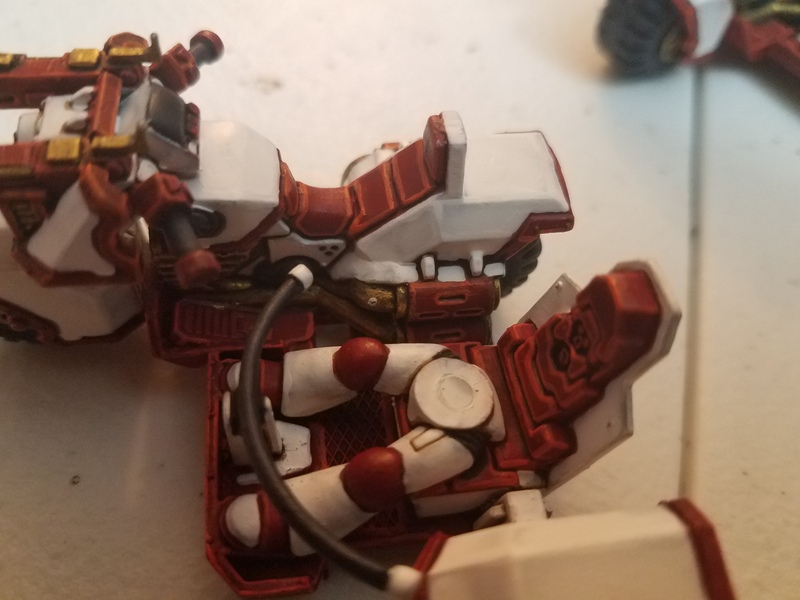 I'm still debating on what to work on after the intercessors be it Tau or the White scars. 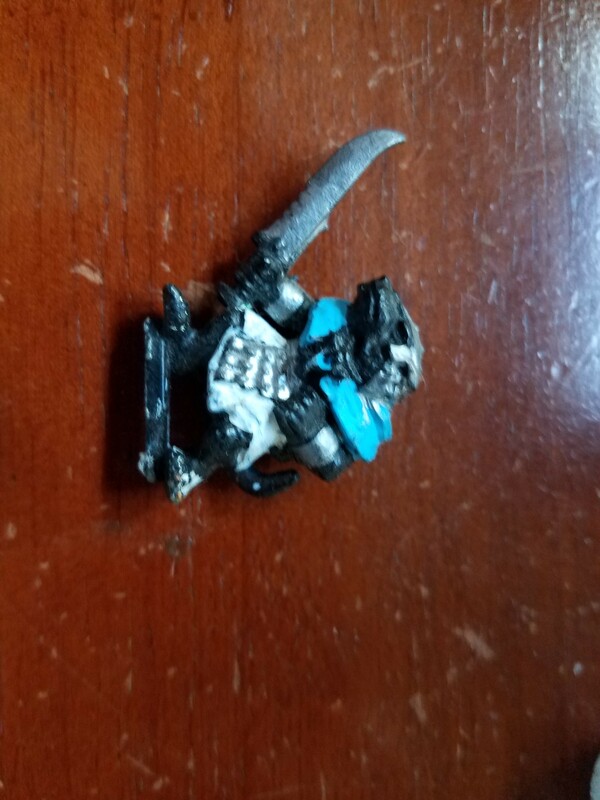 The one unfortunate bit of the Tau models is they will require stripping for the most part. 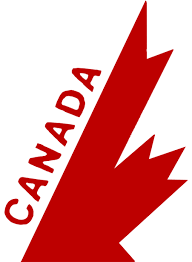 I want to finish the shields I have with an older Team Canada logo which I think will look really slick. 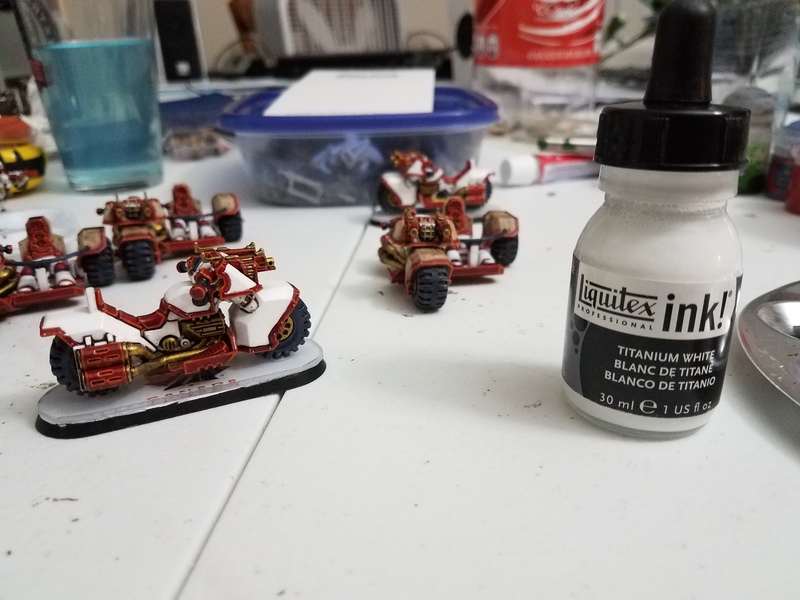 I found some cool guides that use some specialty solvents to adhere and almost dissolve the decals I make onto the surface. I'll write back on how that experiment goes. I'll definitely do this before I move onto the Tau. Hopefully is saves me a lot of time on the shoulder pads. So I had some mixed results with my painting score in rubric scoring and it got me thinking how I may be able to add elements to my army to enhance a score under a rubric. That is not to say I will compromise any of my stylistic choices I still want team canada to be done really clean and simple but there may be categories I can make some small choice differences that would allow me to move up in certain categories. Now I'll point out here that if anyone is disappointed with their relative score always remember that is your rubric score. If you painted a masterpiece that didn't get any of the other boxes checked off you would lose every time because someone else will score max for painting and have nice bases or something. Rubric scoring grades you on how futsy and nice your army is. Further rubrics change between events so unless you are prepping for a major event with a consistent rubric it doesn't make sense to build to a specific one. However looking at one as a guide and using the judge's feedback can allow you to take some critical feedback on your painting that a lot of times you don't get in a friendly environment where people are more likely to point out some things they like rather than criticize a fault. I do like to paint stuff to do well in a tournament and I'm kind of using the rubric as a guide to point me to some different techniques I haven't used or haven't used enough. Overall painting based on my philosophy is always aimed at max and getting it or not depends on a judge's personal preference so I'm not worried about it nor would I be willing to chang in that category as I like both my armies looks. 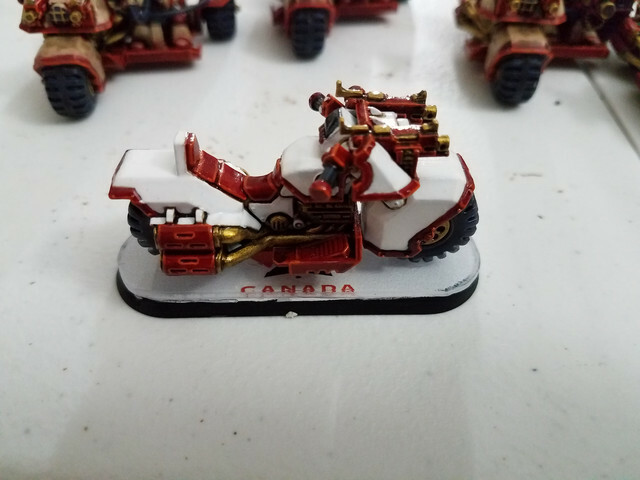 Modelling/Conversions: For Team Canada I have minimal body/head swaps. I also want to keep them clean. My strategy to get a decent score will be to do some high quality greenstuff work and make some very customized characters to be the standouts. The Tau suits are almost all heavily converted but before I build my drones I may consider how to convert them a bit. I'm less concerned about the Tau. They have some complicated stuff in there and conversions are sort of core to that list for some models. Basic painting. Not sure what is meant by seamless blending but that to me is something to work towards. Not too worried about this but I am thinking about trying out a wet palette. I hear they are all the rage. Advanced Painting: No way on either of my armies was I getting full points. Team Canada would never get it with Decals either. So how could I add some freehand when I want my leafs crisp and consistent? I am going to start playing with object source lighting. Should be plenty of opportunity to practice that too with my tau drones. Basing: I am staying as is for now. I like my bases and until I have a compelling reason I am not really changing them. I do need to find a nice clear 2 part epoxy for the team canada bases though with a longer set time. I tried using a glaze medium but that didn't hold and the super glue doesn't have a long enough work time and can leave voids or bases with the ice on top not quite centered right. I may consider resin bases for my Tau in the future. We got a new kitten so there is a bit more competition for my painting time than usual. So I've been slacking on painting recently and switched tracks. It seems mentally I needed a break from painting all that white. 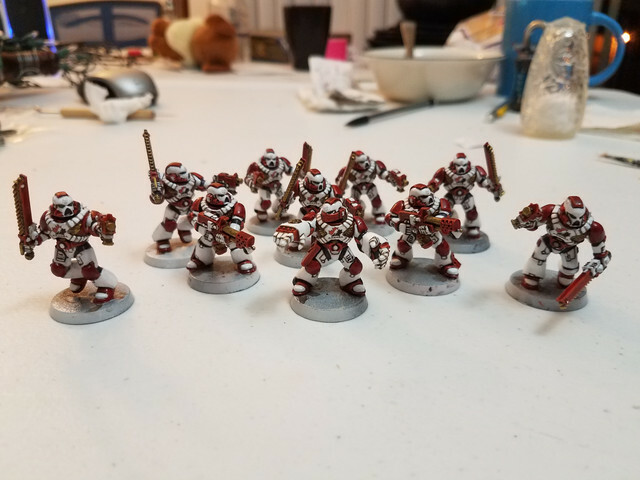 So I started a unit of 12 fire warriors and a fireblade and got them almost complete. 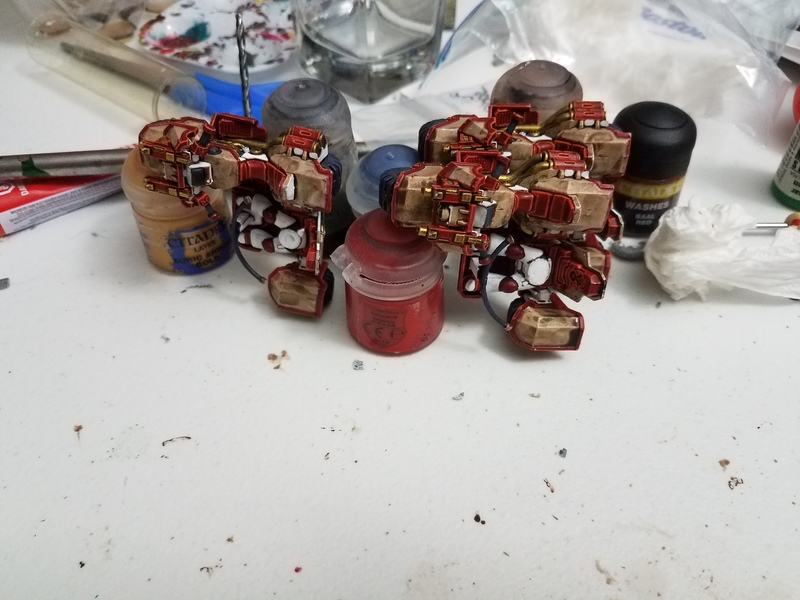 I've also been stripping and prepping more of those Tau models my brother gave me. All the while my intercessors sat with just needing a few final touches to be finished for a while lol. But I played a game last week with team Canada so I channeled that energy into the intercessors and brought them over the finish line so that they are now sealed and just waiting for me to find a nice 2 part clear epoxy and the mandrill in our shop for our hole cutters. Pretty happy with the way they came out. It's really nice to have 16 done now so I have my 3 5 man squads. I just need to get a couple more guys with power swords and I'll be all set on the intercessor front for a while. So I blew out the paint more then you purchase but my brother hit me with a ton of extra infantry. I'm super close though being only 13 models away from tying and 14 from getting ahead. Which is really close but I don't think I can make it there. I have another batch of fire warriors and some more fire blades set up with their base coat. I have 6 sniper drones that I converted up that should be quick too. Hmm... I'll have to think about if there is a way I can finish my current projects and squeeze out 14 more models to a high standard by next Friday as I'll be out of town after that. Well expect pictures of Fire Warriors in the near future. No models in Team Canada or Tau TAC lists unfinished. Anybody else trying to paint more models then you bring in? How close are you? Anybody else setting objectives for the next year?